Macroscopic marine algae (seaweeds or sea vegetables) form an important living resource of the near-shore environment. For millennia, people have collected seaweeds for food, fodder for animals, as well as fertilizers and soil enhancers. More recently, seaweeds have become important sources of various biochemicals, such as phycocolloids, and are important in medicine and biotechnology. We all use seaweed products in our daily life in some way or other. For example, some seaweed poly-saccharides (sometimes referred to as phycocolloids) are used in toothpaste, soaps, shampoo, cosmetics, milk, ice cream, processed meats and other foods, air fresheners, and many other items. In many Asian countries such as Japan, China, and Korea, they are dietary staples. Seaweeds have also been gaining momentum as new experimental systems for biological research and are now being promoted in polyculture systems as an integral part of integrated multi-trophic aquaculture (IMTA). Traditionally, seaweeds were collected from natural stocks or wild populations. 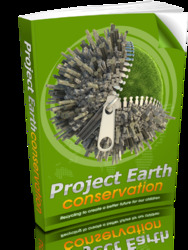 However, these resources were being depleted by overharvesting, so cultivation techniques have been developed. Today, seaweed cultivation techniques are standardized, routine, and economical. Several factors may account for the success of large-scale seaweed cultivation including the unravelling of complex life histories, regenerative capacity of the thalli, prolific spore production, and the understanding of environmental interactions. Different taxa require different farming methods. Although some seaweeds need one-step farming through vegetative propagation, others need multistep farming processes. The latter must be propagated from spores and cannot survive if propagated vegetatively. Eucheuma, Kappaphycus, and Gracilaria are propagated vege-tatively (one step), whereas Porphyra, Ulva, Laminaria, and Undaria are started from spores. Although large-scale open water cultivation of some species has been carried out in many Asian countries, other species are cultivated in tanks and ponds. For example, Chondrus crispus Stackhouse has been mainly cultivated in tanks in Canada. Gracilaria is being cultivated in tanks and raceways in Israel and in man-made ponds in China, Taiwan, and Thailand. Tank cultivation of some Eucheuma spp. was tried in Florida and other parts of the world; however, it was economically unsuccessful. Epiphytes, fouling, and critical nutrient requirements caused serious problems. The major scientific challenges for successful tank cultivation are: (1) site selection; (2) tank design and construction; (3) knowledge of the reproductive biology of the species; (4) selection of the best strains; (5) control of the environmental variables including temperature, pH or CO2 availability, light and salinity; (6) plant agitation to remove boundaries for nutrient uptake; (7) seawater exchange/nutritional requirements; and (8) stocking density. A critical review of these factors may be found in the works of Craigie and Shacklock (see the 'Further reading' section) which focus on the cultivation of Chondrus crispus, the most successfully cultured seaweed species in tank-culture. During the last 50 years, approximately 100 seaweed taxa have been tested in field farms, but only a dozen are being commercially cultivated today. Table 1 provides production data for the top five taxa as of 2004. A brief introduction to life cycles and cultivation techniques of these species is presented in subsequent sections. Modified from Aquaculture production 2004 (2006) FAO Yearbook, Fishery Statistics, vol. 98/2. Rome: FAO. Porphyra has an annual value of more than US $1.3 billion and is considered the most valuable maricultured seaweed in the world. According to the Food and Agriculture Organization (FAO), nearly 1 397 660 metric tons (mt) (wet weight) of Porphyra were produced through mariculture. Porphyra has nearly 133 species distributed all over the world, including 28 species from Japan, 30 from the North Atlantic coasts of Europe and America, and 27 species from the Pacific coast of Canada and the United States. Six species of Porphyra (namely P. yezoensis Ueda, P. tenera Kjellman, P. haitanensis Chang et Zhen Baofu, P. pseudolinearis Ueda, P. dentata Kjellman, and P. angusta Okamura et Ueda) are usually cultivated in Asia with the first three being the most commonly cultivated. Porphyra grows from 5 to 35 cm in length. The thalli are either one or two cells thick, and each cell has one or two stellate chloroplasts with a pyrenoid, depending on the species. Porphyra has a biphasic heteromorphic life cycle with an alternation between a macroscopic foliose thallus (the gametophytic or haploid phase), and a microscopic filamentous phase called the conchocelis (the sporophytic or diploid phase). Porphyra reproduces by both sexual and asexual modes of reproduction. In sexual reproduction, certain mature vegetative cells of the thallus differentiate into carpogonia, and others on the same or different thalli differentiate into spermatangia. After fertilization by ameboid sperm, the resulting fertilized carpogonia divide to form packets of spores called zygotospores (=carpospores). After release, the zygotospores germinate, usually on a calcareous substrate, and develop into the filamentous 'conchocelis' phase. The conchocelis phase can survive in adverse environmental conditions but eventually gives rise to 'fat filaments', then conchosporangia, and finally conchospores under the appropriate environmental conditions. The conchospores germinate in a bipolar manner to give rise to a chimeric thalli, thus completing the life cycle. Asexual reproduction happens only in some species (e.g., P. yezoensis), through formation of blade archeospores (previously referred to as monospores). The conchocelis serves as a perennating stage in nature. The conchocelis can also be maintained in laboratory cultures for long periods through vegetative propagation. Cultivation of Porphyra began in Japan, Korea, and China during the seventeenth century or possibly earlier depending on folk-lore from each of those countries. Modern techniques for Porphyra cultivation were introduced to these countries in the 1960s. The culture methods of Porphyra in all countries are basically very similar, with minor modifications, such as adaptations to local growing areas and traditional practices of local farmers. The cultivation technique involves four major steps (Figure 1): (1) culture of conchocelis, fat filaments, formation of the conchosporangia and production and release of conchospores; (2) seeding of culture nets with conchospores; (3) nursery rearing of sporelings; and (4) harvesting. Seeding may be accomplished by introducing chopped pieces of fertile (ripe) Porphyra blades into the seeding tank, which are removed after the release of the zygotospores. The zygotospore suspension can be prepared artificially by air-drying the fertile thalli overnight and then immersing them in seawater for 4-5 h the next morning (this will induce mass shedding of zygotospores) or by grinding the fertile blades and separating the suspension of zygotospores by filtration. The zygotospore suspension is then introduced into the seeding tank, where the spores settle on the calcareous substrate. directly on calcareous substrates. The advantage of this technique is the use of defined strains that give a more consistent crop. In each case, the seeded substrates are kept in large tanks (0.25-0.5 m deep). The shell substrates are either hung vertically or spread across the bottom. The conchocelis is allowed to develop during the rest of the summer under low light levels (25-50 p,mol photons m-2 s-1), at 16:8 h L:D and at 23 °C. Recently, bioreactors have been developed for the culture of 'free-living conchocelis' of native North American Porphyra species in laboratory. In this method, clones of conchocelis are vegetatively propagated to produce enough biomass for mass production ofconchos-pores. Large amounts ofconchocelis can be produced and maintained in bioreactors under controlled temperature, light, photoperiod, and salinity. The conchocelis are induced, in mass, to produce reproductive fat filaments, forming conchosporangia and conchospores. The process is less cumbersome and requires less labor. Mass release of conchospores can be induced as needed and seeded onto nets. Conchospore formation and release usually requires a particular combination ofconditions such as nutrient availability, temperature, photoperiod and photon flux density, depending on the species. Conchospore release is promoted by stirring, using compressed air bubbling, or by treating cultures with lower temperature seawater (18 °C from 20-22 °C). For the latter treatment, conchocelis-bearing shells are transferred to lower temperature sea-water tanks 5-7 days before seeding. Replacing the seawater in conchocelis culture tanks and adding vitamin B-12 can also promote conchospore release. To inhibit conchospore release, conchocelis tanks may be covered by black vinyl sheets and the culture seawater maintained calm with little, if any, aeration. China, and Korea depends on artificial seeding of con-chospores from hatchery grown conchocelis. In these countries, 'seeding' commences in autumn when the water temperature begins to decrease to 18 °C but this can vary depending upon species. The nets are traditionally 1.8 m wide and 18 m long and made of synthetic twine 3-5 mm in diameter. The nets may have a mesh size of about 15 cm. In Korea, nets 2 m x 100 m are now being routinely used in commercial cultivation. Artificial seeding may be done outdoors in the sea or indoors in shallow hatchery tanks. Outdoor seeding is carried out in nursery grounds by setting up layers of (12-16) nets on support systems. Hatchery-produced mature conchocelis (con-chocelis that has gone through several developmental phases including fat filaments and conchosporangia) on shells or on artificial substrata are placed in plastic bags and hung under the nets. The released conchospores float on the water and are collected in the nets. Indoor seeding may be done by fixing the net either over a rotary wheel or a conveyor belt that is rotated in a seeding tank containing mature conchospore inoculum from the free-living conchocelis culture (Figure 1d). Another method, popular in China, is the indoor seeding of nets that are suspended in shallow seeding tanks about 25 cm in depth. The conchospores are inoculated by re-circulating water via a submersible pump that is in the tank. The nets that are seeded with the conchospores are stacked into bundles of four or up to 12-16 nets. These stacks of layered nets are transferred to the sea for nursery cultivation. In nursery culture, the nets are put into the sea and carefully monitored for blade development. During this early stage, the nets are raised out of the water daily to expose the young thalli to air and sun (nursery stage). This exposure is necessary to reduce fouling organisms (e.g., other seaweed species or microscopic algae such as diatoms). 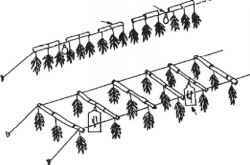 In Japan, a popular system, called the 'Ikada' system, is used for this process (Figure 1e). In China, Professor X. G. Fei has developed a floating A-frame system that can be easily raised and lowered for supporting nursery nets and controlling the degree of exposure (Figure 1f). Once blades are 2-3 mm, the nets can be transferred to the farm sites or frozen for later use. These nets are initially air-dried to reduce the water content of Porphyra to 20-40% and then are stored at -20 °C. The frozen nets can then be used to replace lost or damaged ones. When nursery-reared seedlings are 5-30 mm in length, they are ready for out-planting. 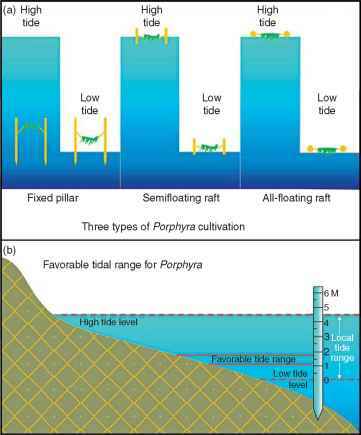 Seedlings may be separated from the bundles using one of three methods of cultivation: fixed pole, semifloating raft, or floating raft (Figures 2 a and 3 a). The fixed pole method is used in shallow intertidal areas (Figure 2b). The floating type is designed for deeper waters. Specially designed harvesting boats lift the growing Porphyra nets (Figures 2a and 3b-3d). The semifloating raft is a hybrid of these two methods and is most suitable for areas that have extensive intertidal zones as at the mouth of the Yantzee River Estuary in China (Figure 2c and Figure 3a). The out-planted Porphyra seedlings are allowed to grow to 15-30 cm in about 40-50 days before they are mechanically harvested (Figures 3c and 3d). The remaining thalli are allowed to grow and may be ready for a second harvest after another 15-20 days. Several harvests may be made from the same nets in one growing season as archeospores from the thalli reseed the nets during the growing season. Nets may be routinely harvested 6-8 times during the growing season (every 15-20 days), with yields of more than 3300 standard sheets (approximately 20 cm x 20 cm) per year. The red alga Gracilaria contributes approximately 66% of the total agar production, according to the most recent estimates. This contribution is likely to increase as cultivation expands and technologies are developed to increase the gel strength of Gracilaria. Although more than 150 species of Gracilaria have been reported from different parts of the world, the taxonomy of the genus is still in flux. Gracilaria is widely distributed all over the world, but most of the species are reported to be from subtropical and tropical waters. Major Gracilaria-producing countries are by far, according to 2004 FAO data, Chile and China, followed by Taiwan, South Africa, Namibia, the Philippines, and Vietnam. Morphologically, the thallus of Gracilaria is cylindrical, compressed, or bladelike and irregularly branched, giving a bushy appearance. Gracilaria has a typical Polysiphonia-type or triphasic life history. The male and female gametophytes in the early stages appear identical without the aid of a magnifying lens. Subsequently, the latter can be easily identified by the presence of cystocarps, which appear as distinct hemispherical lumps all over the thalli. The cystocarp releases a large number of carpospores (2n) that give rise to the tetrasporophyte plants (2n). Each diploid tetrasporophytic plant is morphologically similar to the haploid gametophytic plants (i.e., they are iso-morphic). The tetrasporophyte phase produces haploid tetraspores by meiosis within cortical sporangia. The tetrasporangia ultimately give rise to tetraspores that germinate into male and female plants, thus completing the triphasic life cycle. Gracilaria is cultivated commercially through a number of methodologies. be located near both seawater and freshwater sources to insure salinity control. Sites should also be protected from strong winds. Gracilaria tolerate a wide range of salinities (10-24 psu), but it is important to check other ecological conditions such as temperature, light, and pH (>7.5-8.0). Healthy branches of Gracilaria from natural stock must be selected for successful farming. Thalli of Gracilaria are usually vegetatively propagated for successful large-scale production; however, in some instances spores (either carpospores or tetraspores) may also be used to seed substrates for some farms. Gracilaria cultivation is mainly practiced in three different ways: open water cultivation, pond culture, and tank culture. Open water cultivation is practiced in estuaries, bays, and upwelling areas. Gracilaria has been cultivated in ponds on a large scale only in China and Taiwan. 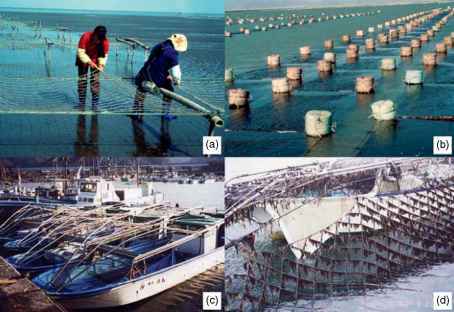 Figure 3 (a) Installation of Porphyra nets on semifloating raft. (b) Korean style floating culture of Porphyra. (c, d) Harvesting boat for Porphyra. (b) Courtesy of E. Hwang. (c, d) Courtesy of M. Notoya. Ponds are generally located in areas not exposed to strong wind, situated near the sources of both freshwater and seawater. Several species of economically important marine organisms (e.g., shrimp, crabs, fish, and prawns) are co-cultured in the same pond at the same time - a type of polyculture integrated multitrophic system. The use of tanks may provide the greatest productivity per unit area and is more efficient than any other type of farming. In this type of system, several steps can be precisely controlled and managed to reduce the labor input, although this type of system has high operational (especially energy) costs. 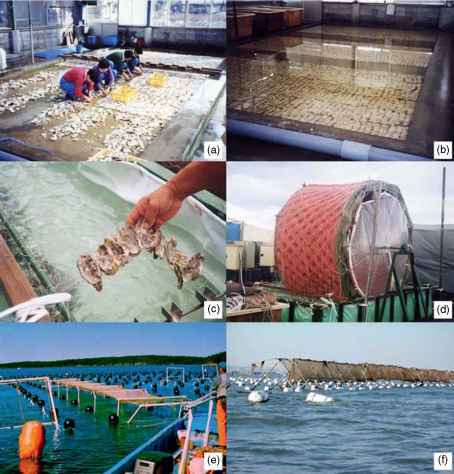 Tank systems may hold promise for the processing of nutrient-enriched waters from fed aquaculture systems (i.e., from finfish or shrimp aquaculture within an integrated multitrophic aquaculture system). Figure 4 illustrates the most common cultivation techniques used. Figures 4a-4d show the bottom stocking method with rocky substrata, insertion of Gracilaria in soft sediment, and bottom stoking with Gracilaria attached to a plastic tube, usually filled with sand. 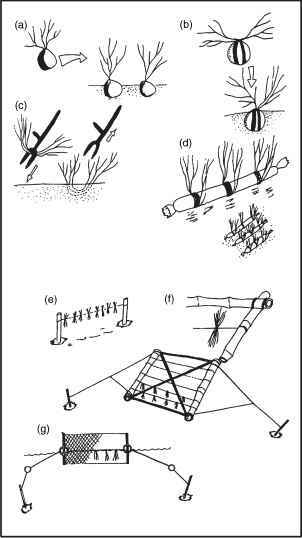 Figures 4e-4g show the method of Gracilaria cultivation attached to ropes in long line systems or in raft systems. The FAO has published several technical papers on Gracilaria cultivation. Eucheuma and Kappaphycus are important carrageeno-phytes and account for over 80% of world's carrageenan production. These taxa are abundant in the Philippines, tropical Asia, East Africa, and the Western Pacific region. Of more than two dozen species known, only Kappaphycus alvarezii (Doty) Doty (formerly known as Eucheuma cottoni Weber-van Bosse) and Eucheuma denticulatum (Burman) Collins et Hervey (formerly known as Eucheuma spinosum [Sonder] J. Agardh) are of major commercial importance. During the last 30 years, these species have been successfully introduced to more than 20 countries for commercial cultivation. The thalli of Eucheuma and Kappaphycus are cartilaginous, cylindrical to compressed, and branched. Some taxa may be prostrate or erect in habit. Gametophytic and sporophytic thalli have been reported for many species. Fertile female thalli develop distinct cystocarps, which appear as mammillate structures. The life cycle is triphasic (same as in Gracilaria) and consists of three stages: tetrasporophyte (2n), gameto-phyte (n), and carposporophyte (2n). The gametophyte is dioecious. The male thallus produces ameboid sperma-tia within spermatangia. The female thallus produces many few-celled carpogonial branches in the cortex of the thallus, of which the tip acts as the carpogonium or receptor cell for the spermatia. Fertilization results in the carposporophyte within the tissue of the female gameto-phyte. The carposporophyte produces carpospores (2n) mitotically that once released develop into the tetrasporophyte phase. Subsequently, the tetrasporophyte produces tetrasporangia, which undergo meiotic divisions producing tetraspores (n). Upon their release, the tetra-spores develop into male and female gametophytes, thus completing the life cycle. Figure 4 (a-d) Bottom stocking of Gracilaria using direct and plastic tube method. (a) Transplantation of rocky substrata with attached Gracilaria to new sites. (b) Gracilaria attached to rocks, with rubber bands for anchorage in soft sediments. (c) Insertion of Gracilaria into soft sediments using a fork. (d) Gracilaria attached to sand filled plastic tubes. (e-g) Attachment of Gracilaria to ropes. (a-d) Modified from Santelices B and Doty M (1989) A review of Gracilaria farming. Aquaculture 78: 98-133; Oliveira EC and Alveal K (1990) The mariculture of Gracilaria (Rhodophyta) for the production of agar. In: Akatsuka I (ed.) Introduction to Applied Phycology, pp. 553-564. The Hague, The Netherlands: SPB Academic Publishing; from Critchley AT and Ohno M (eds.) 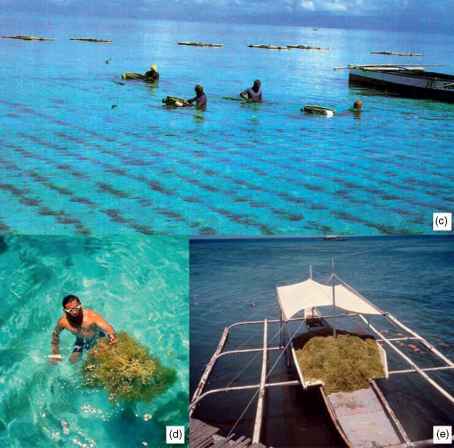 (1997) Cultivation and farming of marine plants. In: CD-ROM, Expert Centre for Taxonomic Identification (ETI), University of Amsterdam, Amsterdam, ISBN 3-540-14549-4. Newyork: Springer. (e-g) From Critchley AT and Ohno M (eds.) (1997) Cultivation and farming of marine plants. In: CD-ROM, Expert Centre for Taxonomic Identification (ETI), University of Amsterdam, Amsterdam, ISBN 3-540-14549-4. New york: Springer. The steps in the farming of these genera include: (1) site selection, (2) selection of cultivation methodology, (3) farm maintenance, and (4) harvesting and drying. Site selection is very important. The site should be far from sources of freshwater such as rivers, creeks, and estuarine areas, as well as other sources of nutrient or industrial wastes. The site should be protected from strong tidal or wind-generated waves, which can destroy the farm. A fixed, off-bottom monoline method is the most popular and convenient method used. Floating methods (raft or long lines) are used when space prohibits the use of the off-bottom monoline method. Maintenance of the farm consists of weeding, repair to the support system, replacement of lost seedlings, and removal of benthic grazers. Farm maintenance is a critical aspect of euchemoid (= Kappaphycus) cultivation. Usually, the plants are harvested after 6 weeks, when each seedling weighs up to 1 kg (Figure 5). Laminaria japonica Areschoug (commonly called 'kelp') is the most widely cultivated species that is primarily cultivated in China, Korea, and Japan. According to the FAO, 4074415 mt (wet weight) of Laminaria were harvested globally in 2004, mainly through cultivation. China is the largest producer of Laminaria, contributing over 4.0 billion kg wet weight. L. japonica grows well on reefs or stones in the subtidal zone, at a depth of 2-15 m (sometimes up to 30 m). They prefer sheltered and calm seas, rather than open waters. The thalli of the edible kelp L. japonica are large, up to 2-5 m in length, but sometimes may grow up to 10 m. The life cycle of Laminaria is well understood. It consists of an alternation of generations between a microscopic gametophytic phase and a very large macroscopic sporophytic phase. In the field, the frond (the sporophytic phase) usually matures during spring and late autumn. The sporophyte releases the zoospores that settle down on a substratum. They immediately germinate and grow into microscopic male and female gametophytes in equal ratios. Upon reaching maturity, the filamentous male gametophyte releases motile biflagellate sperm (from an antheridium) that fertilize a large nonmotile egg that is extruded from the oogonium. Within 15-20 days, young sporophytes develop, thus completing the life cycle. In nature, L. japonica is a biennial, and the frond reaches a harvest-able size in about 20 months after germination. The cultivation period can be reduced to as little as 8-10 months through a technique called 'forced cultivation'. 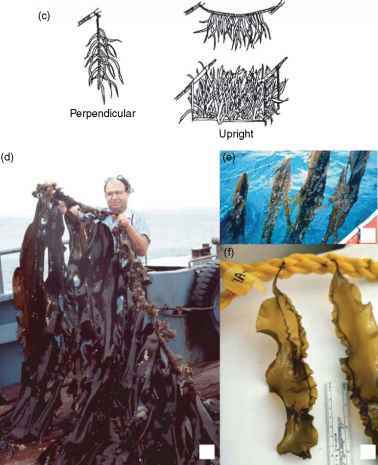 As with Undaria (another species of kelp), the cultivation of Laminaria consists of four phases: (1) collection and settlement of zoospores on seed strings; (2) production of seedlings; (3) transplantations and outgrowing of seedlings; and (4) harvesting (Figure 6). Figure 5 Aspects of Gracilaria, Eucheuma, and Kappaphycus cultivation on ropes. (a and b) Gracilaria attachment and insertion in rope culture. (c) Open water cultivation of Kappaphycus and Eucheuma on monofilament long lines. (d and e). 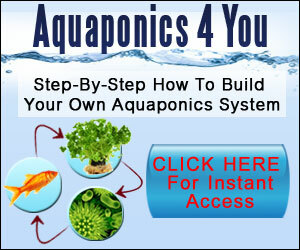 Open water cultivation and harvesting of Kappaphycus. Courtesy of T. Chopin. Figure 6 (a) Single-line bamboo rafts and (b) double-line bamboo rafts. (a-c) Bamboo rafts used for culture of Laminaria in China. (d) Long line with Laminaria after 8 months of growth in the Yellow Sea, China. (e) Long line with Laminaria in South Korea. (f) Young sporophytes growing on long line. (a-c) Modified from Cheng TH (1969) Production of kelp. A major aspect of China's exploitation of the sea. Economic Botany 23: 215-236. (e) Courtesy of E. Hwang. sporelings are transplanted to the seed string and then inserted within the braided long lines that are usually 50-100 m long (Figure 6a). Raft-supported long-line systems are of two types, namely the single-line (bamboo or rubber tube) and the double-line raft system (Figures 6a and 6b). Thirty or more sporelings (attached to the polyester seed string) are transplanted to a 2 m (or shorter) piece of rope. One end of the growing rope (containing the seed string with sporelings) is attached at regular intervals (50 cm) to the main support rope of a raft or long-line system so that the culture rope hangs vertically (the standard Japanese drop-line system; Figure 6b). Aside from light and water temperature, nutrients (especially NO--N) were found to be a limiting factor in the culture of Laminaria. Traditional culture was often limited to waters that were highly fertile, such as those found in bays. As culture systems were moved away from near-shore bays to offshore sites, the introduction of commercial fertilizers (using porous fertilizer cylinders that release nutrients gradually) has significantly extended the kelp-growing area to these deeper oceanic waters. Harvesting of L. japonica takes place during late April to June depending on oceanographic conditions (Figures 6d and 6e). The blades are cut from the cultivation ropes and washed in seawater to remove diatoms, hydrozoans, and other attached organisms. Afterward, the blades are dried naturally in the sun for several days on any available surface. When weather conditions are unfavorable for natural drying, oil-powered dryers may be used. The brown algal genus Undaria (another species of'kelp') is an important food delicacy in Japan and Korea (traditionally known as 'wakame'). It is sold boiled or dried and is especially appreciated as an ingredient for soybean paste soup ('misoshiru') and seaweed salad. Undaria has three species (Undaria pinnatifida [Harvey] Suringar, Undaria undarioides [Yendo] Okamura, and Undaria peter-oseniana [Kjellman] Okamura), and of these, U. pinnatifida is the most important. The production of Undaria has tremendously increased, since its cultivation started in China, by 2000. According to the FAO data, 2 519905 mt (wet weight), valued at more than 1.0 billion USD, of Undaria was produced globally through culture in 2004, with 2 196 070 mt coming from China alone. In nature, Undaria commonly grows in open seas or within bays on the temperate coasts of Japan, Korea, China, and other areas of the northwest Pacific which may have a rocky substrate. Usually, the frond grows to a length of 1-2 m. The life cycle of Undaria consists of a microscopic game-tophytic phase and a large macroscopic sporophytic phase and is essentially an annual species. Young fronds of Undaria appear late in October to early November and grow rapidly until early spring. The mature sporophytes release zoospores that germinate on rocky substrata and develop into male and female gametophytes. After fertilization, the zygote develops into a sporophyte, thereby completing the life cycle. The cultivation of Undaria consists of four stages and is essentially identical to that of Laminaria (Figure 7). It consists of collection of zoospores and seedlings, culture of gametophyte germlings, outgrowing ofthalli, and the harvesting and processing of the thalli. The mature sporophylls are first partially dehydrated to induce release of zoospores and are then placed in culture tanks filled with seawater. Another seeding process called the 'free-living technique' uses vegetative gametophytes grown in flasks and is similar to the Laminaria rearing technology of clonal gametophyte technology. The seeded twine (usually 50 m of seed string) wrapped frames (Figure 7d) are removed from the seeding tank and arranged vertically in a temperature-controlled culture tank about 1 m deep. During summer and early autumn, the zoospores develop into microscopic gametophytes on the seeding frames that are wrapped with the twine. The germlings are allowed to develop to seedlings (2-3 cm) before removal and out-planting along the open coast. The out-planting of nursery-grown seedlings starts in autumn when water temperature is about 20 °C. The original seeding ropes, which initially had seed string inserted within the braided rope, are cut into lengths of 4-6 cm (with approximately 10 seedlings each) and inserted into the twist of the main cultivation rope. They are then set into the sea using rafts or long lines (Figures 7a-7c). Generally, Undaria reaches a harvestable size about 3-5 months after it is transferred to the sea when they reach a length of 0.5-1.0 m (Figure 7e). After the rope is hauled up from the sea on the boat, the cultivated thalli are cut from the rope with a sickle. Each harvested frond is approximately 5 kg in wet weight. The crop may be sold fresh, sun-dried, or artificially dried.